It's Been A Busy Weekend!! SKIPPITY ... HOPPITY ...SHIMMY ... SHIMMY ... BOOTY SHAKE!!!! TA DA!!! The finished quilt top!! And the butterfly's secret plan??? Well, you see, he has so many of his friends with him, that whenever our little hunter bear gets close to catching him, another butterfly swoops in and distracts him and with so many butterflies around, you can see that little bear is going to be all pooped out before too long and will leave the butterflies in peace. Meanwhile, his sister is chatting to another butterfly who is sitting on a pretty daisy, taking in the view. BUT ... is it REALLY a butterfly, or a faerie in disguise?!?! Tee! Hee! Hee! And the name I've chosen for my new quilt??? I've had sooooooooo much fun designing and making this quilt! (well, except for a few sticky moments working out how and when to attach the last row of rick-rack and a few not-quite-level joins ... but other than that ...!!) Now I just have to work out how I'm going to quilt it. Should I just stitch-in-the-ditch so I don't take away from the pretty fabrics?? Should I do some simple diagonal quilting lines??? 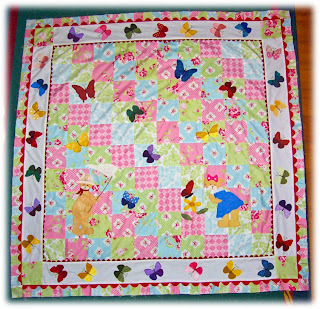 I'd love to hear your suggestions, as I'm better at the applique` part than the quilting!! Then of course, I have to write the instructions ... GROAN!! Still, I hope it won't be too long before I can offer this, my first quilt pattern design, for sale ... and that will also involve a give away... but not for a little while, so you'll have to stay tuned!! Well ... you can see that's what I've been up to for the weekend - in between phone calls, washing and some unexpected-but-welcome visitors. So as soon as I have some lunch, I'll be starting to tally the end-of-month totals for the OPAM Challenge. Don't forget to call back in a day or so to see who this month's prize winner is!! In the meantime, I hope you're all having a wonderful weekend. Til next time - Bear Hugs! Well ... as my title says, I seem to be maintaining my stitching mojo at the moment, with a bit more progress made on my quilt-design-in-progress. Have now finished all the border applique and attached the borders to the centre block. Still deciding how to finish it off, but after quite a lot of playing in PhotoShop this arvo, I think I know what I'm going to do. 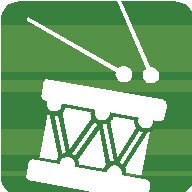 For now, though, I'll tease you a little and build the suspense with another sneaky peek. Ready??? There's the little girly bear smelling her flower and you can see I've used some of the yummy ruby red rick-rack I bought from Sonia at Giggle Buttons at the recent Stitches and Craft show ... and a white border with MORE butterflies!! Are you intrigued yet??? Me too! Tee! Hee! Hee! It's always a bit of a lucky dip as to how a quilt design looks when its finished - often VERY different to my original mental picture!! Hope to spend my day off tomorrow working on the outer border, so stay tuned - I may be back in the next few days with the finished top!! Won't THAT be exciting!!! Mmmmmmmmmmmmm ..... Aviary fabrics!!!!! 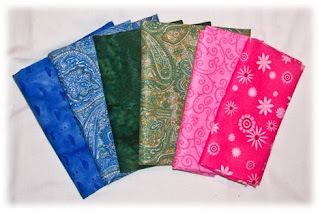 I just LOVE this range of fabrics!! I was a good girl and only bought four pieces ... of course, I already have some charm packs and a little bit of meterage in the cupboard!! Oops! 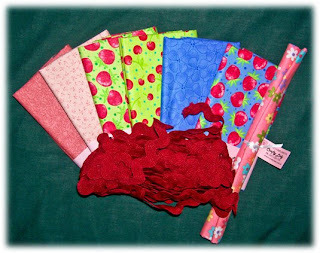 :0) Can't wait to play with this yummy fabric!! 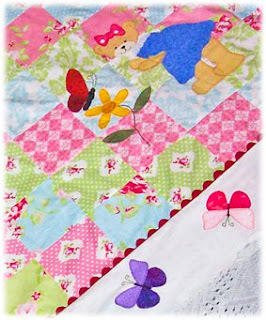 What will it be ... a quilt ... a stitchery border ... a patchwork bag ... a pillow ... a dress for a bear ... OH!!! The endless possibilities!!!! For now, however, I'm off to retrieve my Beloved Geek Boy from work and then do the grocery shopping - a girl's gotta eat to keep up her stitching strength, right?!?! Hope you've got a fun weekend planned. OPAM gals ... don't forget to send me your end-of-month numbers in the next couple of days to be in the May prize draw! Til next time ... Bear Hugs! So ... there you go ... two more finishes added to my OPAM list for May - PHEW!! It was looking a little bit bleak there for a while, as I just don't seem to have had the sewing mojo happening this month - perhaps it was the shock to my summer-orientated system when the cold weather started to hit. 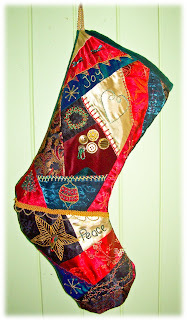 Whatevr it was, I hope I can keep hold of my sewing mojo, cos that "To Do" list just keeps getting LONGER! And speaking of the One Project A Month Challenge ... don't forget, all you OPAM gals, to update your sidebar lists of finishes and sent your end-of-month tally to me by the end of next week - it's my turn to draw a winner and send a prize. Oooooh ... the suspense!! Who will it be this month?? What will the prize be?? Will the sheriff untie the girl from the train track in time?? Oops!! Sorry!! Think I crossed my wires there! Tee! Hee! Hee! Must mean it's time for some lunch! Hope you've had a great week and have some fun stuff planned for the weekend. Til next time ... Bear Hugs! So ... it's a cold (GROAN! ), rainy (YAY!) and miserable (GROAN!!) afternoon in the Garden City on top of the hill. What does one do with oneself? Does one tackle one of the many projects on the ever-growing "To Do" list? Does one tackle the ironing pile? None of the above! :0) How did I spent this cold, wet, windy, damp Wednesday afternoon? Why, I updated my Pinboard of Inspriation!! Tee! Hee! Hee! 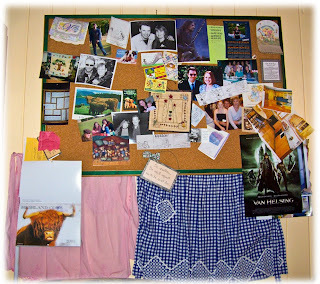 I actually have two Pinboards of Inspiration, since I now work in two rooms - the sewing room and the office. And what do I have on these pinboards? All sorts of things!! Photos of family and friends, bears, postcards, special notes or cards, comic strips, cute pictures found in magazines, decorating ideas, lace, ribbon, inspirational quotes ... whatever tickles my fancy! And WHY do I have these pinboards? Because when I get a bit 'stuck' when I'm sewing or writing pattern instructions, I can take a little mental 'time out' and gaze at my pinboards to give me ideas, to make me smile, but most of all, to remind me how blessed I am to not only be doing something I love, but to be encouraged by so many wonderful people who love me!! And having wasted ... I mean 'spent' the afternoon updating the board in the office, I thought I'd share my 'Inspirations' with you, my blogging buddies, who ALSO inspire me to be creative. I've saved the photos a bit bigger than usual so you can take a closer peek at what's on the pinboards by clicking on the photos. Here's the sewing room board. Under it, I've hung two of my vintage aprons - I seem to have inherited a few from great-grandmothers, grandmothers and aunties!! They were just too pretty to stash in the cupboard and one day (dreaming now!!) when I have my fantasy studio, I intend to display all of my vintage aprons ... amongst other things! :0) Don't know if you can see details, but this one also has a couple of photos I took in a former life when I was working as a Journalist. Close to the centre top there's a photo of a good friend of mine with singer Colin Buchanan and down the bottom the same friend is pictured with singer Graeme Connors. Then, on the left hand side, there's a photo of one of my work experience students with a very famous Aussie movie star behind the sunnies - Russell Crowe!! Ah, a couple of my brushes with fame!! Tee! Hee! Hee! But you'll notice there are more photos of family and friends than famous people, because they are far more 'important' to me than any VIP I met! So ... that's how I spent a rainy afternoon and gives you a little glimpse into what inspires me. 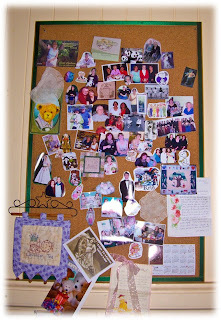 Do you have a "Pinboard Of Inspiration", something that gets your creative juices flowing? What's displayed in your creative area? I'd love to hear/see - perhaps we can have a little 'Show & Tell' - if you want to join in, just post some photos of your creating space or an object of inspiration for you when you're creating and let me know so I can come visit. Let's see if we can't all inspire each other a bit! And now ... I think I'm off to warm my fingers round a hot cup of tea before I have to venture out into the cold to collect my beloved Geek Boy from work. Til next time - Bear Hugs! Boy, oh boy! I think I'll sleep well tonight! With Mum and Dad due for a visit on the weekend, the last part of last week was spent in a frenzy of tidying up several weeks' worth of the flotsam and jetsam that gather in a busy household - including a tidy-up of the sewing room, as my honourary sister, Tiffany, was coming with Mum and Dad to pick up her very own first car - so the daybed in the sewing room had to be cleared - EEK!!! 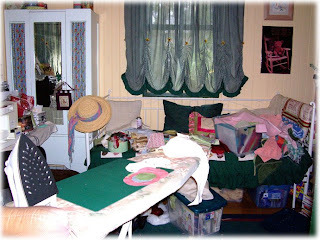 Well ... this is the before photo of the sewing room, so you see what I was up against! Okay, Okay!! So ... it's a little messy!! 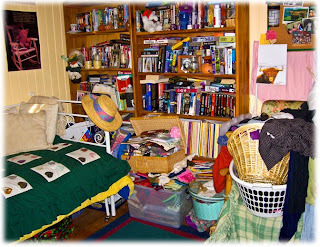 But you've got to remember, this is where I create and creation is never neat and tidy - at least, not in THIS household! :0) And I think my cupboards spit things out when I'm not looking! 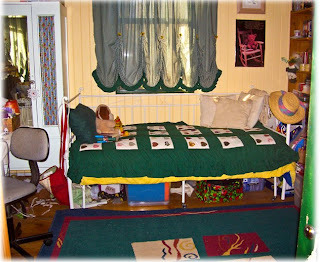 Oh look ... there was a rather pretty daybed under that fabric bomb!! 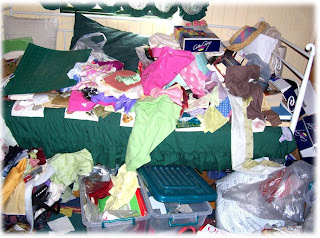 OK, so it's not PERFECTLY tidy, but at least Tiff could crawl into the bed without fear of being smothered by patchwork fabric in her sleep and she could see that she was walking on solid floor, not a sea of threads!! Tee! Hee! Hee! And I DID try to con Joy into doing my ironing, since she was skiting about her basket being empty, but she wouldn't do it - how mean!! :0) Oh ... and can you tell that I'm a bit of a bookworm?? And there's NEVER enough bookshelf space! So there you go ... my weekend in a nutshell - a much smaller nutshell than I bet you were expecting!! Tee! Hee! Hee! You can see why I'll sleep well tonight as I try to catch up a bit! And now ... I'm off to make myself a cup of tea to sip while I FINALLY get around to flicking through the latest "Homespun" magazine that has been waiting for me for the last two weeks. The perfect way to spend an icky, overcast, cold afternoon, if you ask me!! Hope you all had a great weekend and wonderful start to the new week. Til next time - Bear Hugs! If anyone can answer that important question, please tell me, cos I sure don't know!! I feel like I just had a Friday and here I'm nearly at the end of another one with very little to show for the week that got squeezed in between!! How RUDE!! SIGH! I'm not even very sure what I've done to fill in the days cos very few things have been crossed off my "To Do" list this week. Let me see if I can remember SOMETHING that happened this week! a long pocket to pop cutlery into and a smaller one for tea, coffee, sugar etc. 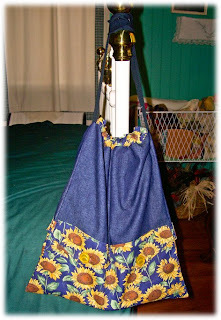 It has a handy draw string closure and a shoulder strap to carry it. I was pretty pleased with how it turned out - and took notes, so it may end up being a new Tag Along Teddies pattern in the future! :0) Hope Mum likes it! And it's nice to FINALLY get a finish on my OPAM Challenge list for May!! Don't forget, all you OPAM gals, to update your finish lists as you go along, so that if you forget to send an end-of-month total email to me or May Britt, we can quickly check your up-to-date list. While I was in the spare room taking photos of Mum's picnic bag, I kicked my toe on a bag of books I'd bought home from Mum and Dad's last time we visited. (My toe's fine, thanks for asking!! Must find a home for those books!) Mum was cleaning out (as she does quite frequently!!) and sent me home with some of my childhood books because I wouldn't let her throw them out! Tee! Hee! Hee! This one was one of my favourites and was so well read that the spine is now broken, but it just has so many wonderful stories that I can't bear to throw it out! You can see it's done many bedtime stints!! 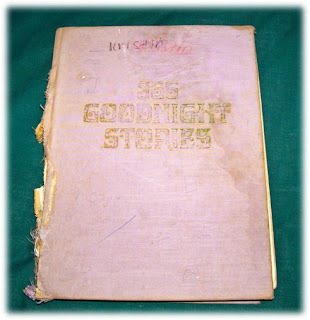 It's a great book, with a story for every night of the week. I was one of those fortunate children whose parents always read me a bedtime story, even for a few years after I could read myself! This was one of my favourite stories - is it any wonder I 'grew up' (something still debated by those who know me well! Tee! Hee! Hee!) to love not only bears, but stitching! This lovely little story tells of a young girl wanting to sew for her teddy and finding only small pieces of fabric that she thinks aren't very useful. 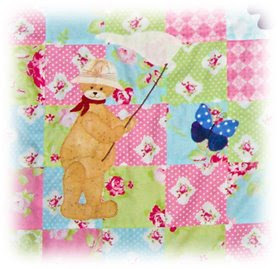 Her clever Mum shows her how to sew the small pieces together to make a patchwork quilt for her teddy - and teddy loved it! 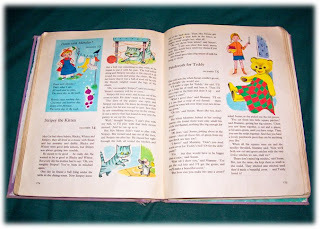 :0) I still remember quite a few of my favourite bedtime stories - what about you? What was your favourite bed time story - I'd love to hear about it!! Maybe if you still have the book, you can post a photo and let me know so I can share, too! And although I'd love nothing better than to curl up with another bed time story ... we've got to be brave and go out into the cold for a friend's birthday dinner. There are some upsides to braving the cold - I don't have to cook and we'll get to catch up with friends! Hope you're having a good Friday night, whatever you're up to! Til next time - Bear Hugs! Well, it's been a busy week - as usual! But I did manage to fit in a fun 'in person' visit with another blogging buddy. Bluebird Lyn and her beloved were holidaying in Queensland to escape the chills of the south and climbed the hill to Toowoomba for a little visit. Now, you KNOW my all time fave place to introduce people to is the Village Green at Highfields, where there just HAPPENS to be my home-away-from-home, Quilters Angel!! Tee! Hee! Hee! Now, after a quick phone call to provide the exact location of the Village Green that the GPS thingummy didn't have programmed into it (isn't technology wonderful!) we met up in the car park, where Lyn presented with with a new 'bearby' for my ever-growing collection. Introducing Tyson and his little green mate who was 'hoppy' to see me (sorry, couldn't resist!!) 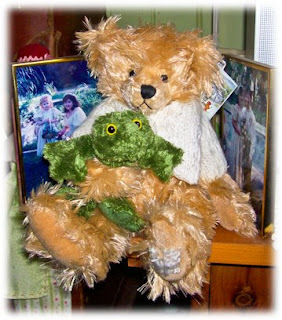 Fergus the Frog! Aren't they GORGEOUS!! Tyson is a Settlers Bear and SOOOOOOOOOOOOOOO soft!! Thank you Lyn!! I feel VERY spoilt!! And do you see ... Tyson has his little white cardie on, ready for Toowoomba's cold mountaintop weather!! Brrrrr! Me too!! 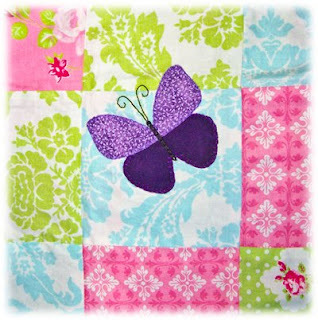 Some yummy blues and greens and, yes, I know it's a shock, more pinks - another butterfly on my quilt-design-in-progress. It was really lovely to chat in-person to Lyn after our cyber chats - now we each have a mental picture to go with the email messages! Thanks for taking a drive up the hill, Lyn - and the wonderfully patient Robert! Although, perhaps it was payback for the time Lyn got to wait around for him while he chatted to people about cars! Tee! Hee! Hee! And whilst on the subject of Marion and Quilters Angel ... Marion and Steph have added a blog to their website to keep us all up-to-date with the doings at the shop - not to mention showing off the yummy new fabric ranges as they come in!! Why not pop over and say G'day! Just click on the blog button on the front page of their web site - oh and maybe you'd also like to check out the page on Stitchers' Dream Day Out, which will again be happening in September. My bestest buddy Lynette and I are scheming and comparing schedules in an effort to get us both there for at least one of the two days of stitching fun again. It will run over the weekend of Saturday 12th and Sunday 13th September 2009, and you can either go to both days, or just one. I'm REALLY excited, cos one of my FAVOURITE designers will be a guest tutor this year - BRONWYN HAYES of Red Brolly!! 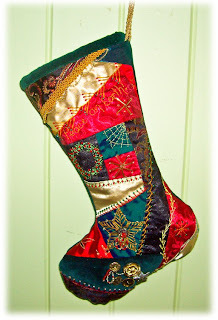 (Had to put that in red since she is best known for her wonderful redwork stitcheries!) Oooooh! How EXCITING!!! And joining her will be the equally talented guest tutors, Shelley Carlile (Shelleyanne), Ella Madsen (Ella and Skysie Designs) and Debbie Magee (Always Stitchin'). 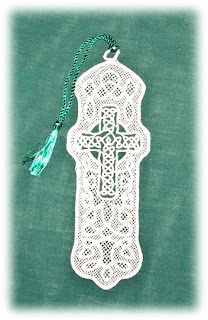 Debbie was one of last year's tutors, too, and her lovely vintage dolly is still on my "To Do" list. There's more info about the Stitchers Dream Day Out on Marion's website if you want to come play with us - last year was FABULOUS!! Great projects, yummy food, lots of prizes and give aways, show and tell, great specials, a chance to chat with some of Australia's leading craft designers, fabulous decorations and atmosphere .... need I say more!! Except maybe - WHAT ARE YOU WAITING FOR!!! Tee! Hee! Hee! And on that note ... I think it's time to go and put the kettle on for a cuppa to warm my toesies - no, I'm NOT going to soak my toesies in my tea!! Although ... that WOULD warm them up!! Not too sure what the tea would taste like afterwards, though! :0) Just kidding!! That's what funky socks are for! Hope you're having a fabulous weekend so far and til next time - Bear Hugs! 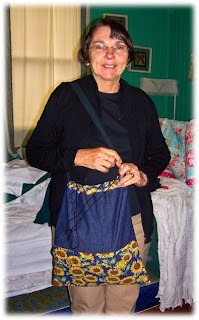 For all of you OPAM Challenge gals who've been waiting with baited breath to hear who this month's draw winner was ... head on over to May Britt's blog, cos after a fun weekend of stitching, she's waded through lists and blogs to choose our Miss April OPAM winner!! And the winner is ... A gorgeous lady! Oh wait! That's ALL OF YOU!! Tee! Hee! Hee! Pop on over and say G'day to May Britt! And while I'm back here briefly (really, Chookyblue, I promise it will be brief!!) I'd like to say thank you to the lovely Rosey for passing on an award to me. 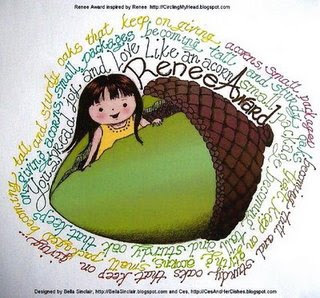 It's called the Renee award and was created to celebrate a special lady who spread friendship like acorns, which in turn grew to spread more 'acorns'. What a lovely thought! Thank you Rosey for passing this to me! I won't even try to choose a small group of my ever-growing list of blogging buddies, but will instead thank all of you for the friendship and encouragement you all add to my life! I don't have any 'in-person' sewing buddies anymore (no I didn't scare them all off!! Some moved, some now work, one owns a business ... you know - that's life!) so it's wonderful to have stitching buddies all over the world to gain insight and inspiration from, as well as feedback and encouragement for my stitching and designing. There ... all over and done without the need for a cuppa, Chookyblue! Tee! Hee! Hee! Hope you've all had a good weekend - extended one here in Queensland for Labour Day, but am off to Meg's Memorial Service this morning, so no stitching. Til next time - Bear Hugs! A fairly ordinary, but OK, week had a bit of a 'mixed bag' ending to it - some sadness, some fun friendship and some productive 'stay home' time. Thursday was a bit of a tough one for me at work. I've mentioned before that I work as an Admin Assistant in the office of a retirement village. Now this means that all of the residents are 65 years of age or older, so I knew when I took the job that part of the reality of it would be having to cope with the death of residents. Knowing that and dealing with the reality are just a bit different. In the early hours of Thursday morning, one of my 'favourite' residents went home to be with her Lord. Her name was Meg and she was so special! She was one of those wonderful people who light up a room just by walking into it and having survived at least two battles with breast cancer and all the associated treatments, she was a frail little bird of a lady - but had so much LIFE!! She was 82, you'd never have guessed it! It was not at all unusual to see her on her wheelie walker, toddling off down the road to visit someone who was a bit down or unwell and she often slipped Tony (our groundsman) a Crunchy or Cherry Ripe chocolate bar to thank him for his work around the village. She was such a sweetie who referred to me as her 'Sunshine' because she said I always brightened up her day, but I think it was she who was the brightest ray of sunshine. Meg always took time to say something encouraging to people she met in here wheelie walker adventures and loved a good laugh, firmly believing that there was something humorous to be found in every situation to help deal with what life threw her way - we were kindred spirits, I think! I often joked that I was going to organise a wheelie walker race down our main entrance road and put my money on her, because I thought she'd charm everyone else into letting her win! And though I am so very sad that I won't see her smiling face anymore or hear her cheerful greeting of "Good morning, Sunshine! ", I feel so privileged to have known her for almost a year and through the tears, I can't help giggling at the image of her scooting past St Peter at the Pearly Gates on her wheelie walker, challenging him to a race! I'll miss you, Meg - save me a seat!! Although it seemed to us there were fewer exhibitors and fewer visitors this year (which did make it easier to see things!) we still managed to enjoy ourselves and both spent some play money. Here's what 'followed me home'! 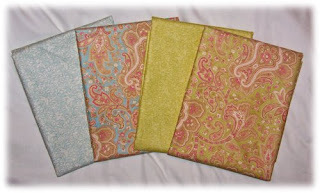 Some pretty new fabrics to play with - they were just so CHEERFUL!! The two pink ones on the left (I know, there I go again, the 'Anti-pink' buying pink fabrics!) have already had little pieces put to use in the quilt-design-in-progress and I'm playing with a few ideas for the others. And do you see the YUMMY dark red rick-rack? I found that at the Giggle Buttons stand, where Lynette and I introduced ourselves to Sonia - who was having a grand old time!! It was lovely to be able to put an 'in-person' experience with the cyber chats and blog photo with our catch up and after seeing Sonia's DELICIOUS ceramic buttons in person, I'm already starting to toy with including some in future projects - just as soon as I save up some more play money after my Lilly Cottage and Craft show blow outs! Tee! Hee! Hee! And with the show over, I bet Sonia's at home with her weary feet up, snuggling with the new kitty in their household - who is yet to receive a puuuuuuuuurmanent name! :0) Sorry - couldn't resist!! Thanks for the chat, Sonia! Will look forward to catching up again soon. And as to Saturday and Sunday ... I've done a few boring 'household' chores, but mostly I've got in some seriously productive stitching time, which has been GREAT! The quilt-design-in-progress is ... progressing! And I'm really happy with how it's coming up. Now I DID promise another sneaky peek, so ... are you ready? Isn't it just GORGEOUS!!! I think Teresa has machine embroidered it onto netting and then starched it or stiffened it somehow! Thank you soooooooooo much Teresa! You really made my day!! And the great thing about receiving a bookmark of any kind - I'm a voracious bookworm, so am always in search of bookmarks!! I've told Teresa I think I'll have to make sure this is the one I'm using if I take a book to read in a waiting room - so I can show it off! Tee! Hee! Hee! 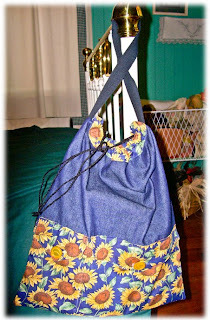 So ... there you have a wrap up of my 'mixed bag' end to the week. Hope you've had a good one and if yours was a bit of a 'mixed bag' too, then I hope there was plenty of friendship and fun bits to help balance the 'not-so-fun' bits'. Oh ... and a quick "CHEERIO!" to my blogging buddy Kerryanne who has had to visit Dr McDreamy again for a follow up hospital stay following her bone graft surgery earlier in the year. I know she's still off the air for a couple more days, but pop in and leave her a 'Get Well Soon' message to cheer her along in her recovery! Til next time ... Bear Hugs!